The Great Lake Explorer experience focuses on the architecture, the music and the beauty of the region. This tour includes a behind the scenes look at the architectural influences of Frank Lloyd Wright, and the musical influences of Buddy Guy and Junior Wells. We enjoy stylish wines in the Leelanau Peninsula, relax on Mackinac Island and celebrate the craft beer industry in Milwaukee. This tour is meant to immerse the traveler in the experiences of the region. DAY 1: This evening, mingle with other group members at a meet and greet reception hosted by our Tour Manager, a destination specialist. 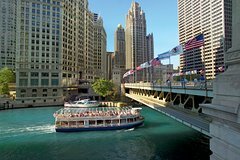 DAY 2: Board an exclusive Chicago Architecture Foundation’s photography river cruise, designed for the photographer, or photographer at heart. This afternoon, choose between a walking tour and learn the basics of Chicago’s sinful history, all the way from the city’s first vice district, to Capone, Prohibition and the mob. Explore the basics of different beer styles and beer’s influence on criminal enterprises, especially during Prohibition. Or choose to glide along the Lakefront on your very own Segway, through the fragrant floral paths and rose gardens of Grant Park to the Museum Campus. Tonight, visit Kingston Mines. Kingston Mines is the largest and oldest continuously operating blues club in Chicago. Its two stages have been graced by the likes of Junior Wells and scores of other musical greats. DAY 3: Travel to Holland, on the shore of Lake Michigan. The Dutch heritage is plain to see in the traditional Dutch architecture and ambiance. Stroll the quaint downtown and enjoy its galleries, shops and eateries. Continue north to the Leelanau Peninsula. Here we visit some of the peninsulas noted wineries. The evening is spent in Traverse City. DAY 4: Board the ferry to Mackinac Island. The entire island is listed as a National Historic Landmark and is well known for its wide variety of architectural styles, including the Victorian Grand Hotel and its ban on all motor vehicles. Day 5: You can explore Mackinac Island your way. Bicycles and horse-drawn carriages are the only modes of transportation here. You can pick up a bicycle and gear, along with trail maps guiding you on various routes throughout the island. Or relax on a guided horse-drawn carriage instead. Day 6: Michigan ranks fifth in the nation in the number of breweries, microbreweries and brewpubs. Late afternoon we make the ferry crossing across Lake Michigan to Wisconsin. Tonight, visit Milwaukee's most unique downtown food destination, the Milwaukee Public Market. Day 7: Visit the Milwaukee Riverwalk and Milwaukee Art Museum. Tour past the elegant mansions along Lake Michigan with numerous photo opportunities at the city’s most unique landmarks. Take in City Hall, the Milwaukee Art Museum, North Point Light-house, Miller Park, the Historic Third Ward and more. This afternoon visit the Harley Davidson Museum. Enjoy a final night dinner together at a Bavarian Bierhaus. Day 8: Arrive in Oak Park, once the home of Frank Lloyd Wright where he designed and built some of his earliest buildings. Tour the Wright home and see the birth-place of Ernest Hemingway before time for lunch in the village.